Note: Volumes sold under the Bipartisan Budget Act of 2015 Section 404 are estimates based on an assumption of $50 per barrel. Yesterday the U.S. Department of Energy's (DOE) Office of Fossil Energy awarded contracts for the first of several sales of crude oil from the Strategic Petroleum Reserve (SPR). A Continuing Resolution enacted in December 2016 included a provision for DOE to sell up to $375.4 million in crude oil from the SPR. This sale will be the first of several planned sales totaling nearly 190 million barrels during fiscal years 2017 through 2025. As the largest stockpile of government-owned emergency crude oil in the world, the SPR was established to help alleviate significant oil supply reductions from occurrences such as major geopolitical events, severe weather, unplanned production curtailments, transport disruptions, and delivery outages. Located in four storage sites along the Gulf of Mexico, the SPR held more than 695 million barrels of crude oil as of January 13, or about 97% of its design capacity (713.5 million barrels). The Bipartisan Budget Act (Section 404), enacted in 2015, includes authorization for funding an SPR modernization program to support improvements deemed necessary to preserve the long-term integrity and utility of SPR's infrastructure by selling up to $2 billion worth of SPR crude oil in fiscal years 2017 through 2020. Although the estimated volumes presented in the chart above are based on an assumed oil price of $50 per barrel, the actual final sales volumes will depend on how SPR decides to allocate the sales volumes across those fiscal years and the actual price of crude oil at the time of the sales. For the Section 404 sales, SPR must get an appropriation from Congress to approve its requested sales revenue target. Another section of the Bipartisan Budget Act (Section 403) mandates SPR crude oil sales for fiscal years 2018 through 2025 on a volumetric basis, rather than on a dollar basis, as specified in Section 404. The revenues from sales authorized under section 403 will be deposited into the general fund of the U.S. Department of the Treasury. The 21st Century Cures Act, enacted in December 2016, calls for the sale of 25 million barrels of SPR crude oil for fiscal years 2017 through 2019. The first portion of these sales is expected in late spring 2017. The Fixing America’s Surface Transportation Act, enacted in December 2015, calls for SPR sales totaling 66 million barrels from fiscal years 2023 through 2025. One of the SPR's core missions is to carry out U.S. obligations under the International Energy Program (IEP), the 1974 treaty that established the International Energy Agency (IEA). Under the IEP, the United States must be able to contribute to an IEA collective action based on its share of IEA oil consumption. Based on the most recent shares, the United States must be prepared to contribute about 44% of the barrels released in an IEA-coordinated response. The United States government relies on using oil in the SPR to meet this requirement. Previously, in response to oil supply disruptions driven by hostilities in Libya in 2011, the United States contributed as much as 50% of the total IEA collective action. As a member of the IEA, the United States is obligated to maintain stocks of crude oil and petroleum products, both public and private, to provide at least 90 days of net import coverage. Based on October 2016 levels of net crude oil and petroleum product imports, the SPR alone holds crude oil stocks equivalent to 145 days of import coverage. 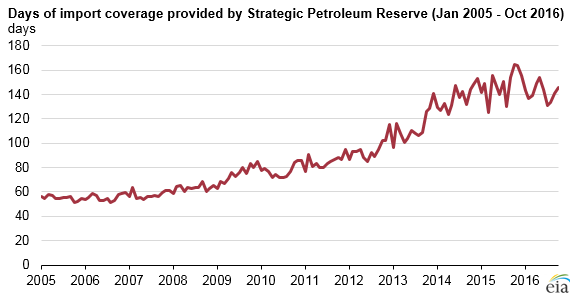 Private (commercial) stocks of crude oil provide another 489 million barrels, equivalent to another 102 days of import coverage. Note: Days of import coverage reflects Strategic Petroleum Reserve level divided by net imports of crude oil and petroleum products. More information about the role of the SPR is available on the DOE's SPR web page.